One beautifully uneventful Monday I decided to treat myself to lunch at Fig, the famed restaurant inside the Fairmont Hotel in downtown Santa Monica. An occasion to put on presentable clothes (other than my LuLuLemmons and fluorescent bumblebee sneakers) had been few and far between since arriving in the eternal exercise city. I put on a nice pair of khakis, my leather jacket from the streets of Firenze, and my adorable designer sandals (bought half price one determined sale shopping day at Saks), and I headed downtown in a perky mood. Never discouraged by the thought of dining alone, I walked into the hotel with a smile on my face and happily sat down at a table-for-two looking out onto the hotel’s pool. Now, I am not going to pretend that I decided upon the lentil chili by the will of my own tastebuds. No, I will forthrightly admit that I spotted this good pick on Giada’s twitter page. Trusting her native West LA opinions, I skimmed over the rest of the menu and quickly ordered this light but filling dish. 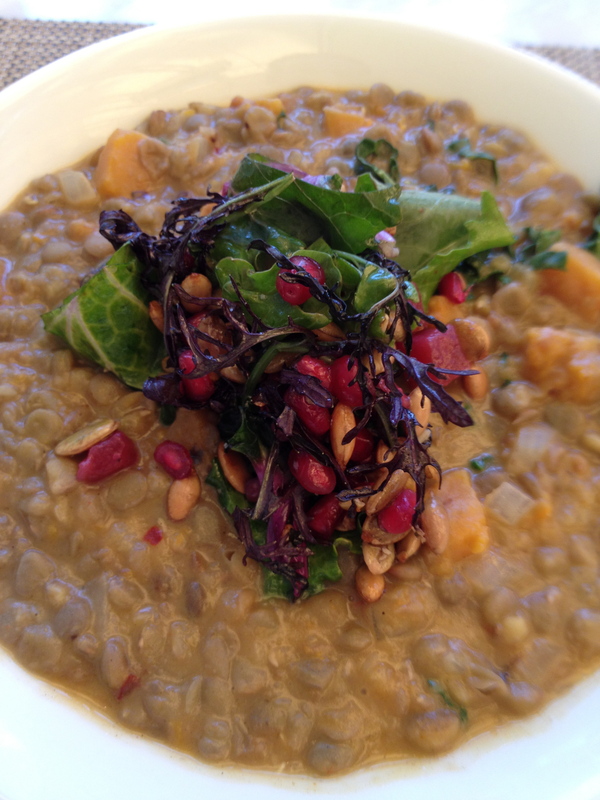 It was the perfect combination of spicy (strong cumin flavoring) and fresh, with the greens fluttering among the lentils. Each bite was accompanied with a pomegranate seed, an ingredient I found to be playful and a sour burst of flavor that cleverly balanced out the hot spices. The perfect portion and the perfect lunch, I left fully satisfied. So, molto grazie, Giada, for your spot-on recommendation!